U.S. will keep troops in Afghanistan past 2016. U.S. Army personnel leave a truck inside an Afghan military base during fighting between Taliban militants and Afghan security forces in Kunduz on Oct. 1, 2015. Update, Oct 15, 8:30 a.m. President Barack Obama will officially announce on Thursday that he is slowing the withdrawal of U.S. troops from Afghanistan. The New York Times reported on Wednesday that President Obama is considering keeping U.S. troops in Afghanistan past the end of 2016, when a full withdrawal was scheduled to be completed. This was widely expected after the Taliban took over the northern city of Kunduz last month, the first urban area it had controlled since 2001. Afghan forces finally retook the city on Tuesday, but the Taliban’s ability to capture it at all was a major blow to confidence in Kabul’s capacity to maintain security in the country without U.S. military support. There is also growing alarm about recent gains by ISIS-affiliated groups in the country. There are currently 9,800 U.S. troops in Afghanistan, part of an international force of 13,000, participating in counterterrorism and training missions. The pace of withdrawal has already been slower than the optimistic timetable laid out when combat operations officially ended at the end of last year. According to the New York Times, the most popular option currently on the table at the White House was one proposed by Gen. Martin Dempsey last year that would keep 3,000 to 5,000 troops in the country on a counterterrorism mission. 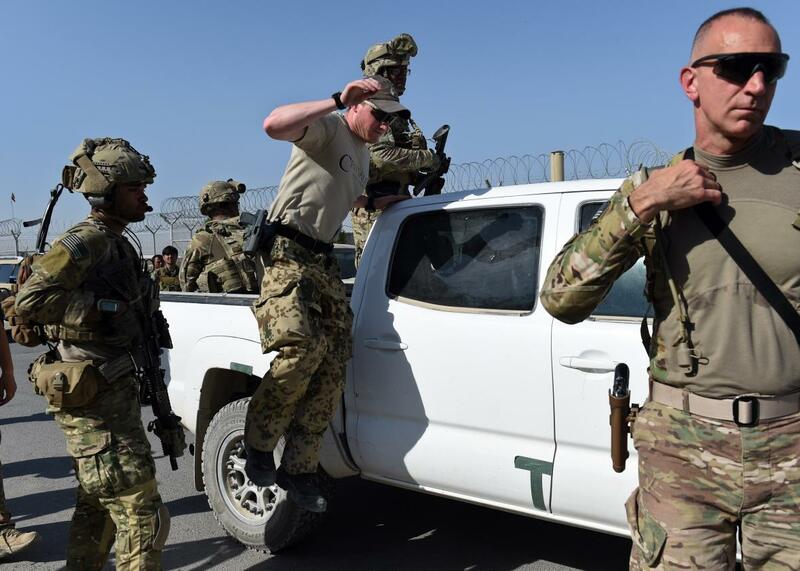 Other proposals range from 1,000 troops based at the U.S. embassy in Kabul to keeping the full force currently on the ground in order to continue the training mission. Adding to the tension around the decision is the aftermath of the Oct. 3 U.S. bombing of a Doctors Without Borders hospital in Kunduz. At the organization’s behest, a Swiss-based international fact-finding commission established under the Geneva Conventions says it is ready to begin an investigation of whether violations of international humanitarian law occurred in the strike, but it is currently awaiting the consent of the U.S. and Afghan governments. (Photojournalist Andrew Quilty of Foreign Policy published graphic images of the inside of the hospital earlier this week.) The controversy may be yet one more reason that Americans are tired of long-term overseas military operations, but it’s still unlikely to affect the administration’s thinking on keeping troops in the country. For one thing, the current Afghan government is pushing for a longer-term international military presence and isn’t in much of a position to complain about civilian casualties. Pressed by Yahoo News to substantiate that claim, a spokesman for the National Security Council listed Syria, Iraq, Pakistan, Somalia, Libya, Afghanistan, and Yemen. This would seem to imply that the president does not consider the U.S. to be at war in these places, or even in “military actions.” U.S. troops have recently participated in combat in three of those countries—Afghanistan, Syria, and Iraq—not to mention carrying out covert actions or providing logistical assistance in the other four. So Obama’s argument makes sense only if you define combat operations solely as large numbers of ground troops, a definition that doesn’t make much sense given the technologies of 21st-century warfare. If a large U.S. counterterrorism force remains in Afghanistan past 2017 and the U.S. continues to provide more and more direct aid to forces fighting in Syria and Iraq, Obama can no longer portray himself credibly as an ender of wars. Like Bush before him, he’s going to be leaving several to his successor.